Everyday is like a hike – most of the time we stay on the trail, occasionally we forge new ones. The trails represent the how of living: paths that we have either created or were taught by those who came before us. But unlike the trails on the mountain, many of our own patterns of living are invisible to us. Have you ever stopped to think about how you dry yourself after getting out of the shower? Probably using the same pattern for years, and one that is unique to you. We all do this without thinking and this is but one of many trails that we follow in life without thought. There are many others: the way we eat, the way we communicate, the way we work. 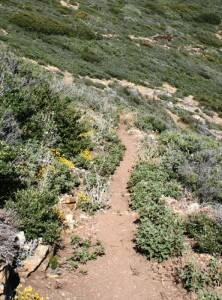 We create trails as a way of simplifying the world around us. It provides us with a way to navigate the various challenges and complexities of life so that we can not devote time thinking about things we’ve already figured out. But for the very reason that the patterns become hidden to us, they can also lull us into a false sense of security. Doing something differently feels uncomfortable, yet the only way we can grow is to question our patterns of behavior in the past. Plus variety is the spice of life. Even though it feels uncomfortable to go off-road, doing so allows us to experience vistas that we may never have seen if we continued following the same old trails.